Hoffa test: Firm pressure applied with the thumb inferior to the patella outside the margin of the patellar tendon with the knee in, (a) 30-60 degrees of flexion (b) fully extending, and increased pain in the infrapatellar fat pad indicates a positive test. Repeat test on both medial and lateral sides (6). Based on the structures highly vascularized and innervated structures literature lacks concrete prognosis or outlook of infrapatellar fat pad inflammation. There are many nonoperative and operative treatments to consider based on patient demographics and presentation. (1) Eivazi M, Selfe J. Infrapatellar fat pad lesions: theoretical considerations and practical implications. Physical Therapy Reviews [serial online]. February 2008;13(1):11-16. (2) Bennell, K., Hodges, P., Mellor, R., Bexander, C., & Souvlis, T. (2004). The nature of anterior knee pain following injection of hyertonic saline into the infrapatellar fat pad. Jounal of Orthopaedic Research, 22, 116-121. (4) Paulos, L., Wnorowski, D., Greenwald, A., , , & , (1994). Infrapatellar contracture syndrome. diagnosis, treatment, and long-term followup. Am J Sports Med, 22(4), 440-449. (5) Dragoo J, Johnson C, McConnell J. 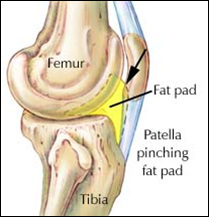 Evaluation and Treatment of Disorders of the Infrapatellar Fat Pad. Sports Medicine [serial online]. 2012;42(1):51-67. 9Swan A, Mercer S. Anatomy of the infrapatellar fat pad. New Zealand Journal Of Physiotherapy [serial online]. March (6)2005;33(1):19-22.